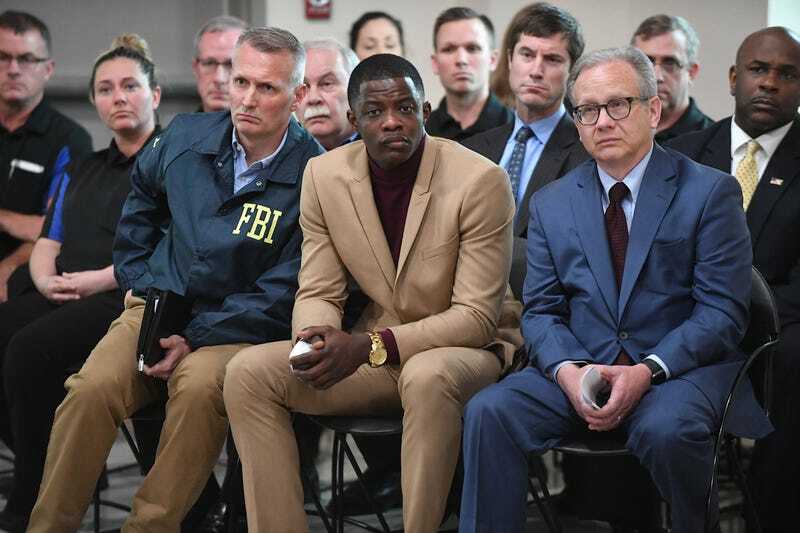 Filed to: James Shaw Jr.Filed to: James Shaw Jr.
Waffle House patron James Shaw Jr. (center), who disarmed the gunman in the fatal mass shooting at a Tennessee Waffle House, appears at a press conference with FBI agents and Metro Nashville Mayor David Briley (right) April 22, 2018, in Nashville, Tenn.
James Shaw Jr. is a lot of things, an electrician, a father ... and, as of now, a bonafide hero after he wrestled a gun away from an active shooter at a Tennessee Waffle House, putting an end to the gunman’s massacre. The early-morning Sunday shooting left four dead and several others injured. As The Tennessean reports, Shaw went to the Murfreesboro Pike Waffle House in Antioch, Tenn., with longtime friend Brennan McMurray after leaving a nearby Waffle House on Bell Road that was packed. The two friends arrived at the Murfreesboro Pike location around 3:20 a.m. At about 3:25 a.m., authorities say, a gunman, clothed only in a green jacket, opened fire with an AR-15 rifle. It is what Shaw did next that has the community singing his praises and thanking him. The 29-year-old rushed the gunman as he attempted to reload, snatching the weapon’s barrel and pulling the gun away from the shooter before throwing the weapon over a counter at the restaurant. During the scuffle, the young father suffered a gunshot wound and burns from grabbing the gun’s barrel. Despite his seemingly fearless actions, Shaw says he doesn’t feel like a hero, insisting that he was only trying to survive. When the suspected gunman, identified as 29-year-old Travis Reinking, opened fire at the fast-food chain, Shaw said that he initially thought the noise was an employee dropping dishes. Then he saw a man on the floor and he jumped toward the bathroom as the gunman shot at him. He said he was grazed by a bullet. Then the shooter came through the door but needed to reload, and so, Shaw took his chance. “I distinctively remember thinking that he is going to have to work for this kill,” Shaw said. “I had a chance to stop him, and thankfully I stopped him. “I grabbed the gun and kept it down. He had one hand on it. I pulled it away and threw it over the bar,” he added. After a brief tussle, the gunman walked away. Shaw said he didn’t follow because he was unsure if the shooter had another gun on him. Police are still searching for Reinking as a person of interest and have issued homicide warrants. Still, Shaw shies away from being called a hero, or even taking credit for saving the lives of others who were at the Waffle House. “I choose to react because I didn’t want to die. I just wanted to live. I didn’t really fight that man to save everyone else. That might not be a popular thing to say,” Shaw said during a news conference. “He is a hero in my books,” his friend McMurray said. Shaw “is the hero here, and no doubt he saved many lives by wrestling the gun away and then tossing it over the counter and prompting the [gun]man to leave,” a police spokesman insisted, according to CNN. Another witness, Chuck Cordero, who saw everything from outside the Waffle House’s huge windows, agreed. Even as he is being praised as a hero, Shaw has not forgotten about the victims who were lost. “There’s four families that are grieving right now. So much life was lost for no reason. I feel like it could be very selfish of me if I didn’t point it out. And I apologize,” he told WSVM. The hero is determined to give back to those families, and has launched a GoFundMe campaign to benefit the victims of the shooting. In a mere 12 hours, the campaign raised $13,814 of its $15,000 goal. Shaw says he would also like to stay in touch with the families, as well as those who survived the horrific incident. “I hope we can bring violence in all facets—not just gun violence, but all facets of violence—to an end,” he added.